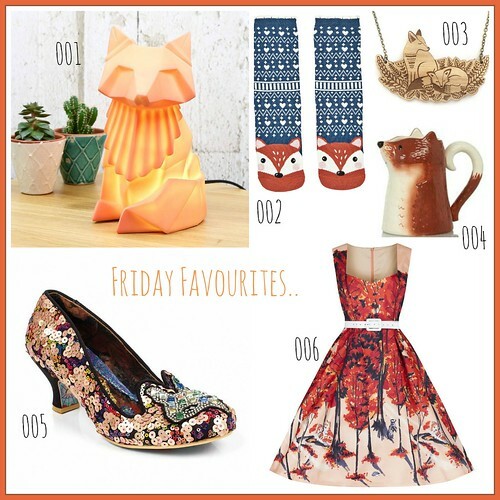 t*rexes and tiaras: Friday Favourites 220.. I seem to have developed a bit of a habit for themed wishlists over the past few weeks. This week, for some reason, I seem to be drawn to all of the foxes. 001: These origami lamps are just wonderful. I have three dinosaur ones dotted around the flat already and various animals wrapped up for Christmas gifts. They create such a warm glow. 002: Because who doesn't need cute new socks? I've thrown two pairs away in the past 24 hours! 003: Layla's new woodland designs are just lovely - look at these cosy foxes...! 004: I might have already ordered this milk jug. I don't even drink milk, but I think he would be perfect to store my ever-expanding collection of knitting needles in. 005: Irregular Choice seem to be coming out with so many lovely new designs, lately and these foxes are so sparkly. 006: Ah, Lindy Bop, who still seem to be knocking it out of the park with their new designs. This dress is in my basket, along with a couple of others - oops! Aaaaaah, temptation!!! I've had fox obsession for a while and you are not helping me!!! Absolutely adore that Layla Amber one-sooo sooo pretty! Those shoes are gorgeous and I did see and was tempted by that dress. How sweet is that lamp!!!! Sorry - they do seem to be everywhere at the moment and show no signs of stopping. We get more and more fox items in the shop each week and they still sell like hot cakes! I love the LB woodland print, hoping to get something with that on it at some point. I'm so in love with that milk jug, it's so cute! It's really pretty. I prefer the sleeveless dresses but I know they're doing a long-sleeved version of this at some point, too.